I love fast food and I am banned from going to all-you-can-eat buffets. It's a self-imposed ban from the all-or-nothing school of thought. I look at fat people and think, 'why can't you stop eating?' You eat when you are happy and eat when you are sad. It fills a hole in the soul with a carbohydrate-laden substitute for love. For many, it is the first thing they think about in the morning and the last thing they think about at night. When John Paul II died, I ran into the radio studio to tell Sean Moncrieff during an ad break. "We got a free delivery of Italian ice cream! Oh, and the Pope died." This week Scotland decided whether or not to break away from England after 300 years of Westminster rule. I visited Glasgow for Newstalk to cover the Scottish Referendum. I used to live in Glasgow so memories started flooding back. The question on my lips wasn't whether Scotland should go it alone but why was I such a fat Scottish kid? 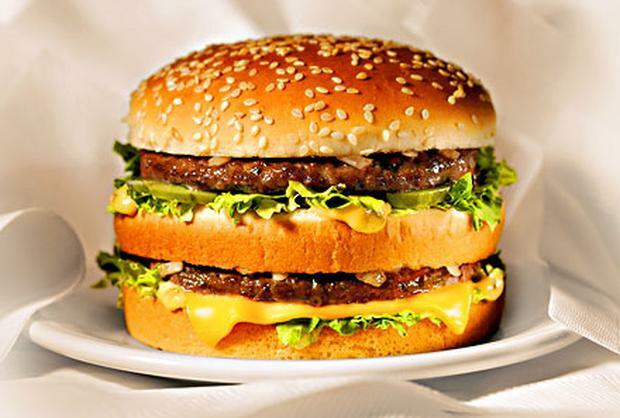 I had my first Big Mac in Glasgow in 1988. Growing up my brother used to call me Fat Boy Slim. Not after the DJ but because I was a slim boy who was actually rather fat. My Scottish grandfather died after his seventh heart attack. Heart disease runs in my family and I could go the same way. But I pay little heed to my genetic heritage, just as I casually disregard media health warnings and public shamings. In Dublin I was asked to get out of a lift at the Guinness Storehouse because it had reached its weight capacity. I felt humiliated. A week later I visited McDonald's in Longford and a kid shouted, "Look mum, look at that fat man", so I ordered the whole euro-saver menu and ate myself to happiness. During the British Empire, Glasgow was the most powerful city after London thanks to ship-building, tobacco and the slave trade. It's now a proud - though somewhat shabby - city of Celtic and Rangers supporters, trying to get to grips with poverty and social issues. The city is still on a high after a successful Commonwealth Games. Last week in Glasgow I met 'Yes' campaigner John Hannah who said, "Iron Bru is made from iron girders, crumpled up by Scottish hands, rung out into great big vats and put into cans". I personally feel it's more like sweet Irish red lemonade. Back in Ireland, I was recently asked if I was on death row and facing the electric chair, what would my final dinner be? A Big Mac meal, I answered unflinchingly. More recently, in Kilkenny, at 10.25am, I had an urge for a Big Mac but I was told burgers are only served after 10.30am. So I waited and ordered the menu. That being a Big Mac meal, McChicken Sandwich, six McNuggets and a cheeseburger. Am I a pig or is it my Scottish heritage? To be fair, McDonald's offer healthy options, warn that their food should be eaten as part of a balanced diet and have started to display the calories of all their products. One of the big issues of the Scottish Referendum was Scotland's health. In some parts of Glasgow the male adult life expectancy rate is lower than Iraq: just 54 years of age. Is it because of bad weather, drugs, alcohol abuse and gang culture? Or is it because of deep-fried Mars bars? I asked David Walsh of the Glasgow Centre for Population Health. He reckons it's because of "historic, rapid industrialisation followed by rapid de-industrialisation. They tend to be poorer as a result and have poorer health". He feels the deep-fried Mars bar is a myth even though some Scots love anything covered in batter. Later, I met trader Garry in the Barras, a market area of the city. I asked him why Glasgow men are dying so young. Is it heroin or bacon butties? "You are standing in an area of Glasgow where the average life expectancy is lower than the Gaza Strip," he told me. "You can have your Iron Bru and bacon butties, but you need to balance it with a bit of jogging." I fell in love with fast food back in Kuwait in 1985. My dad worked for Kuwait Airways and we moved to the Middle East before the first Gulf War. On the beach in Kuwait City my brother bought me a cheeseburger. It was the combination of the warm bun, ketchup, mustard and beef. The sweet taste made me feel like there was a party in my mouth and everyone was invited. I moved to Ireland from Scotland during Italia '90. The country was on a high. Ireland had got to the World Cup quarter-finals. Jack Charlton's Put 'Em Under Pressure was number one in the charts and I discovered Eddie Rockets. My mate's girlfriend was a waitress in 'Empty Pockets' and she gave me free food any time I visited. At one sitting I had the Cheese Please, malt shake, a foot-long hotdog, chicken tenders and chocolate ice cream, all washed down with a coke float. Yes, the way to a man's heart is through his stomach but I wasn't going to steal my best friend's girl. Yesterday a cute lady I know found out my favourite dessert is tiramisu so she made me a family-sized bowl. I ate the whole thing in one sitting and we kissed afterwards. I once tried to break the Guinness Book of World Records for eating the most Creme Eggs in one go. I managed 13 in three minutes, but the officials wouldn't recognise it because they thought it was silly. On Mother's Day I bought my mum a box of Quality Street but it turned into Occupy Quality Street. I ate the whole box and she got nothing. It soon got to the point when I had to admit that I needed help. So I met sports psychologist Enda McNulty, who works with top sports stars and the Irish rugby team. Enda tried to get to the bottom of my love of fast food. He helped me lose four stone and managed to click a switch in my head. I now know I'm eating to fill a void in my life. To paraphrase Roxy Music, food is the drug and I need to score. In Glasgow last week I tried a deep-fried Mars bar. The Coronation Restaurant will deep-fry anything if you ask them politely. Cook Rena said, "they are still popular", as she battered the infamous chocolate bar in front of me, dipping it into a vat of fat the size of a small bath. Then it was time to bite into the crisp batter and to my delight it didn't melt but was hot and sticky. The fat man has escaped. Somebody call the fat police. . .